A tropical island, a gramophone, flotsam, jetsam and one hapless castaway. 20 years pass in 40 minutes as records spin and rescue never comes, then as the island gives up its secret the show ends in a beautifully surreal spectacular finale. The show happens on a small stage complete with two palm trees which double as hammock anchors and slackrope ends. Kept on the island by a shark in the audience our castaway makes friends with Larry, a lobster and struggles to survive. Every time he retires to his hammock he wakes up years later with a longer and longer beard, clothes more dishevelled and with another crazy plan. Eventually, after walking an impossibly wobbly rope between the trees, he discovers treasure and wakes Larry’s big sister. 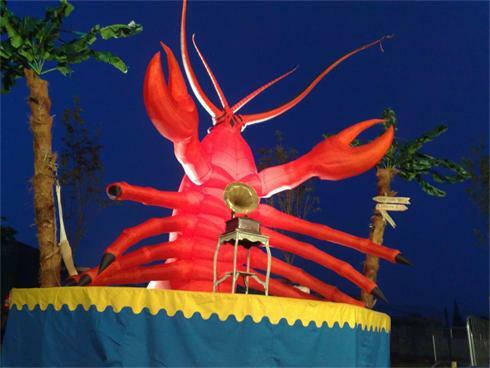 As the twenty foot high inflatable lobster emerges spectacularly through the stage, he finally escapes in the most unlikely of helicopter rescues!